Supply network managers find themselves increasingly confronted with the problems caused by ageing drinking water pipes. So of every 100 litres of water leaving a treatment plant, less than 80 actually reach the consumer. Network pipeline leaks certainly have an ecological and economic cost, but they can also pose the risk of water contamination. Hence the significant level of effort now being focused by operators and local authorities on locating individual leaks. The latest innovation in the field is acoustic listening. That technology is the basis for the innovative solution implemented by Saur, which uses the EAR© (Ecoute Active des Réseaux – Active Network Listening) solution developed jointly with Sainte-Lizaigne and Seba KMT. EAR© involves the use of a sensor containing hydrophone membranes in direct contact with the water flowing through the pipes at the heart of the domestic service network. These membranes are designed to sense – and “translate” into waveforms – the specific sounds generated by water leaks. By filtering out irrelevant sounds, EAR© makes it possible to gather a direct stream of data that records sound levels and frequencies throughout the water column. Any significant change in this frequency could be indicative of a leak within a 200-metre radius, including in PVC and HDPE pipes. The data generated by the EAR© sensors are uploaded via the GSM mobile phone network to the experts in the OCC©, who can then analyse and use the centre platform to schedule field maintenance teams to carry out the necessary work. Field operations staff can then use the Saur network sectorisation system and remote correlation to locate the leak to be repaired with an accuracy of 1 metre. EAR© allows Saur to offer a genuinely valuable advantage that sets the company apart from its competitors in terms of effective customer network management. This service is now integral to a series of solutions for the smart management of drinking water infrastructures. It is also fully consistent with the environmental responsibility commitments adopted by Saur and designed to alleviate pressure on natural resources. Many local authorities have already grasped the importance of the solution and are now enjoying the substantial gains generated by EAR©. 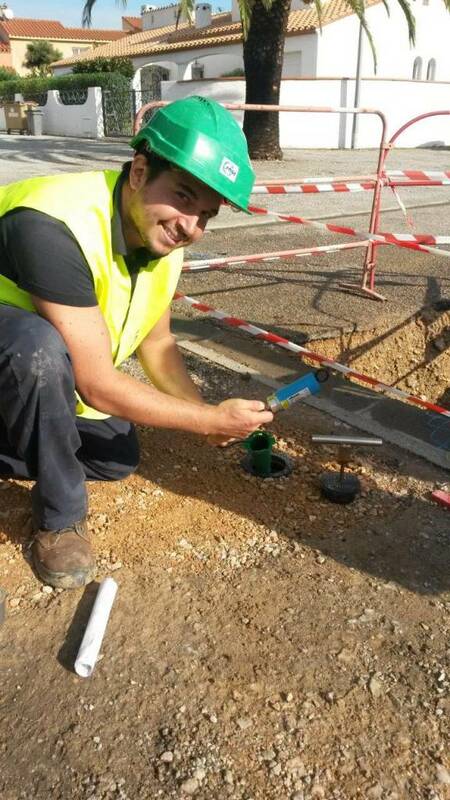 So between now and the end of the year, more than 1,000 connections of this type will have been deployed throughout France. With the result that hundreds of thousands of cubic metres of drinking water will have been saved. In addition to Saint Barthélemy (see inset), EAR© has been installed in many regions of France, including Nevers (Nièvre), Vendée Eau, Perpignan Méditerranée (Pyrénées-Orientales), Châteauroux (Indre), Nîmes Métropole (Gard) and Arles (ACCM – Bouches-du-Rhône). On the island of Saint-Barthélemy in the French West Indies, where water is produced by two seawater desalination plants, network efficiency is – logically! – an absolute priority. So when Saur took over responsibility for the island’s drinking water infrastructure, the company installed the EAR© system in conjunction with network sectorisation. The result was that by 2015, network efficiency was 83.4%, compared with 69.1% only two years earlier. That improvement is equivalent to 95,000 m³ of water saved from wastage every year.